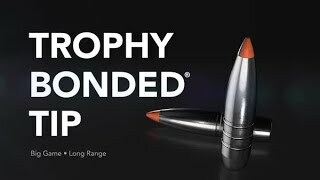 Federal Premium® now offers the legendary Trophy Bonded® Tip as a component bullet. The proven design stands apart from all other big game bullets, combining bonded construction, a bone-crushing solid copper shank, boat-tail design and a high performance polymer tip that tightens groups at long range. Rated 5 out of 5 by drfireman from Great bullet Loaded for my 270 WSM. Running about 3100fps. Perfect performance on first deer shot. Head down facing me, not best shot but what I had, bullet went end to end, stopping just under skin in hind quarter. Shot through spine between shoulders, it did not move out of its tracks. Same performance on other deer as well, DRT!